I guess haven't felt like taking many pictures lately. This guess is based on the fact that I only took two pictures in the past week or so. It is getting a bit chilly out and I haven't wanted to be outside much which means a lack of things to take pictures of. One good thing about the cooler weather is that I finally get to wear some of my sweaters again. 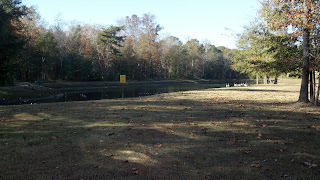 The pond behind our apartment has turned into a goose meeting place. At times there are a lot of geese and they are very loud. Not sure if you can see all of them in the picture. If anyone up north is concerned about the geese and their travels to the south for the winter... don't worry. They are fine and still just as annoying. Lucky has been pouty during my long weekend because all he wants is for me to leave so he can sleep. When I'm home, he feels he has to follow me around every time I move. If he doesn't get his 38 hours of sleep per day, he's not very happy. 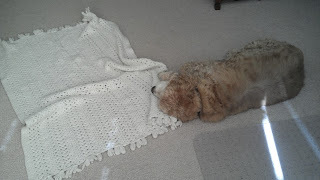 To try to solve this problem, I spread his one blanket on the floor of the living room area. He won't lay on the blanket, but he will bunch up the corner of it to make a nice pillow.